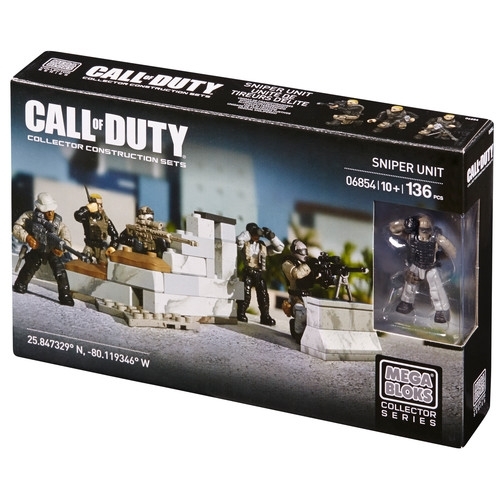 Product Detail Summary: Build the Call of Duty Sniper Unit Collector Construction Set by Mega Bloks. Engage the target using long-range accuracy and stealth coverage with this elite 5-member Sniper Unit, consisting of two spotters, two scout snipers and additional soldier. The super-poseable micro action figures are armed with a variety of authentic and interchangeable precision rifles and secondary weaponry, mountable scopes, detachable bipods and range finders. The buildable sniper nest is the perfect hide for reconnaissance and target acquisitions, and comes complete with detailed camouflage mesh, two barricades and more. For ages 10 and up. Over 25 interchangeable weapons including sniper rifles with mountable scopes, detachable bipods and tripods, removable combat vest, sandbags, range-finders and more!